Griffin PowerMate USB Multimedia Controller | Nerd Much? 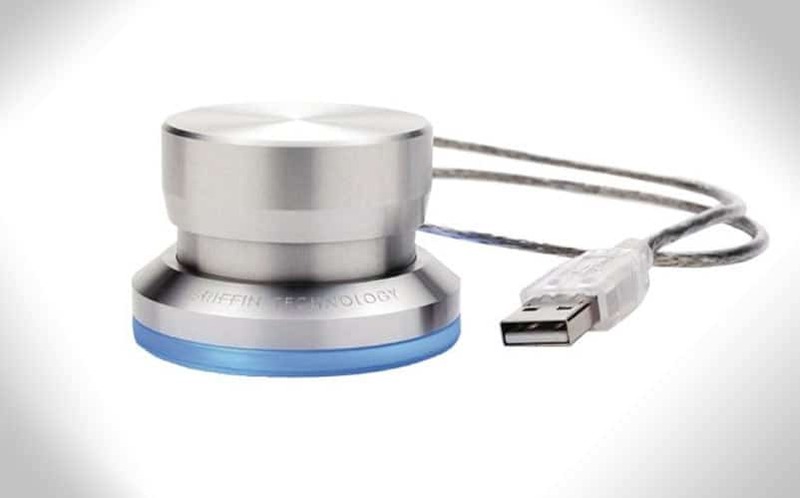 Griffin Technology has a lot of cool gadgets in their lineup of products, ranging from smartphone accessories to the latest in audio technology. One of their coolest products is the PowerMate Bluetooth USB Multimedia Controller. This device not only looks great, with its gleaming brushed aluminum finish and blue glowing base, but it allows you to also control your PC or Mac’s media. You can spin it like a wheel or click it like a mouse, and the device will do whatever you program it to in the software. You can take control of your iTunes, use it as a mouse scroll wheel for webpages, turn up (or lower) your computer’s volume, and so much more. You’re able to use it with video and/or sound editing software, and you can set it up to do an impressive number of things. It allows you to automate repetitive actions and keystrokes, and gives you control over your computer from across the room, thanks to the long USB cord that is included with it. There’s also a wireless Bluetooth version available, although we haven’t tested that one out just yet.